OK, now I'm not one to knock folks for trying something new, but color me skeptical on this one. "... plan to produce three ``Disney/Pixar style'' fully animated low-budget theatrical films with the same technology used in ``Toy Story'', ``Shrek'' and ``The Incredibles'' with a budget of only $1,500,000 per film for the G-Rated movie marketplace, where parents and kids can't wait to buy the next movie ticket." Aside from the tragic comparisons to films like Toy Story, Shrek and The Incredibles... Sounds reasonable, right? I mean, heck, $1.5mil is a lot of beer money. You can get a bunch of stuff done for $1.5mil. Well... not exactly. I'm sure they can make 70+ minutes of film res footage in 14 months. The question that remains is will it be worth looking at? Will the story be any more engaging than your average TV episodic pablum? And the most important of all- Will tens of thousands of parents be excited enough about the idea to fork over $40+ to take their 2.5 kids to go see it with a tub of artery clogging popcorn (payable in 3 easy monthly payments) on the opening Friday night just because it exists? Are parents and kids SO desperate that they'll go see anything? And mind you, I'm not a "big budget is the only way to go" snob. There's no way in the world that every animated feature film needs to cost $100+mil. If you're spending that much on a movie there's a better than average chance that you're wasting some somewhere. There's room in the market place for lower budget features. But there's low budget and then there's walking dangerously close to not dealing in reality. Last year I worked as an animation supervisor on one direct to video feature length project that had an "alleged" budget of $3.5-4mil. Then I directed another direct to video feature length movie for an "alleged" budget of just $2.5mil. I'll be honest- these projects didn't look so hot. Not bad considering the budget and deadlines- certainly servicable in the direct to video toy merchandising market for which they were created. But on the whole they were nothing to write home about visually or story wise despite the talent applied to the task. The most talented artists and writers in the world can only do so much with a given budget. And I certainly wouldn't expect anyone in their right mind to plunk down $8 a seat to watch these things in a darkened cinema. That kind of monetary output for a family demands at least the illusion of a quality exprience. There's a point where if your movie is not up to snuff (ie: more than an extra long outsourced TV show) you can't even think about playing at that level. People wouldn't even come close to getting their money's worth. In the animation biz $1.5mil for a film resolution feature length project doesn't go very far at all. I'd be willing to bet Dreamworks spends that much on food alone for one of their films. (if you've ever visited the Glendale campus and seen the cafeteria you wouldn't doubt it at all. Great food, though. Yum!) Spending only $1.5mil means you're gonna be hard pressed to get anything worth even showing on a big screen, even if you get the entire project done in India. And I won't even get into the hidden insidious costs of the current theatrical distribution system. Basically even among the smallest boutique distributors a theatrical release these days has a significant price of entry, especially if you're gunning for a $25mil return. If they were making direct to video, then I think their plan has a sliver of hope. But if these folks at RM insist on going the theatrical route with these things, well... let's just say I'd be selling that stock. But hey, I've been wrong plenty of times before in my life. And who knows? If they make it work you can bet I'll be the first guy to cheer their success. It'd be great to see something like this work. So in that spirit of hopeful (foolhardy?) support, I wish the good folks at Raven Moon all the luck in the world with this. They're probably gonna need it. Here's a great inspirational article at www.idfuel.com on the value of living life "just cuz". The premise is pretty simply presented: get outside of the narrow confines of your field of expertise (in our case animation) and broaden your horizons by adding a multitude of varying life experiences. In is recent speech to the graduating class of Standford University Steve Jobs called these variety of experiences "dots". Only later in our lives are we able to "connect these dots" to solve the problems before us in our field of expertise. Basically... get out and live. Take that scuba diving class you've always wanted. Go on that trip. Visit that place. Read that book. Take that walk. Go to that concert. Talk to those strangers on the train. Visit that museum. Go on that mission trip. Dance that dance. Teach that class. Volunteer at that hospital. Live life just for the sake of living it, collecting the experience as you go. Someday later you may find that one moment will bring you a unique solution to a problem facing you. 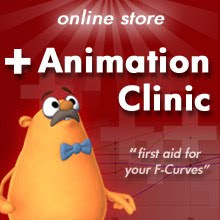 Stuff like animation training is very good and helpful. There are many students out there ardently studying animation in great programs and their zeal and commitment is admirable. But we need to open up our field of view to see a bigger picture. I know my own personal faith has brought me into contact with many, many different people and life experiences that only much later present themselves as unique solutions to my everyday challenges as an animator. Without those life experiences I'd be the poorer animator, and worse, the poorer man. Just took in Howl's Moving Castle this evening. What can I say? I'm just glad that somebody out there still thinks about making worlds with such lush imagination in animation. This stuff would NEVER get made here in the states, and that's a crying shame. Beautiful, entertaining, well animated, wonderful pace, great character moments all with that classic Miyasaki mystical touch are the best ways I could describe it. It's probably not everybody's cup of tea, but I enjoyed every scene. I just was happy to go someplace that fantastic for a couple of hours. Even a short list like this tells us that it (a character feeling real) is not so much a matter of the life quality of the MOVEMENT, as the life quality of the MOTIVATION which makes a character compelling — the audience compares the characters’ psyches to their own looking for a correspondence. This element is key and far less forgiving than animation quality — that can be mitigated but there is no substitute in performance for accurate emotional reality. The recognizable emotional struggle is a primary factor — it gives the character an engine and if this happens to be a main character, it gives the story its engine, as well. This is the foundation, in other words, for that elusive but often sought after character driven storytelling. Combine this with some of the notes I've been reading from Eric Larson lately and my brain is starting to go Uh-huh, oh yeah, that's right, preach it! Anyhow, go read up. Good stuff. Let's think of the action as an expression of the body. In his memo to Don Graham, December 23, 1935, Walt (Disney) chided us saying: "The animators go through animation and don't make the positions of the body express anything." How often do we do that? We just make 'em move and accept that as being animation. It's certainly difficult to express a positive thought when we move the character all over the screen, failing to accept the fact that such action so often destroys personality, making it impossible for the audience to appreciate and relate to our animated character's emotions. Are we in CG animation going through our own "make 'em move all around the screen" phase? Dunno for sure, but maybe we're in a groove collectively where the characters are moving soooo much that it can be hard to dial in to who they are and what they are feeling on many occasions. I really liked Madagascar. Really neat designs, functional story, interesting characters, some good funny bits and some amazingly wild animation. Fun stuff. It looked like the animators were having a blast. But there were times in the film where I did wish things would take a breather and just BE. Robots left me with the same feeling (except the enjoying the movie part. I imagined homemade flyers all over telephone poles in NYC that read LOST: One feature film story. Black with white spots. Responds to the name Bucky. If found please call Fox). Perhaps this hyper-kineticism of motion is just a symptom of growing pains as Cg breaks free of the constraints of lower technology rigging solutions? I got the sense that Madagascar had rigs that could do some pretty fun things deformation wise and those guys were having fun taking their new toys for a spin. I'm guilty of it as well. I tend to go for the bigger action and then dial back from there. And with every new rigging achievement for greater deformation I say Hey, let's try this move. Look man, I got me a new toy and dangit I'm gonna use that puppy. Heh. I know when we got some more stretchy squishy rigs at work we had a time of trying to figure out how to use them. Some of the first tests were pretty wild to say the least. Maybe it's the fact that we have a whole industry of animators groping along the learning curve that represents the typical maturation of a medium. I think folks are experimenting with styles, working to establish a motion lexicon that has more entries in it besides "Pixar Style". Perhaps another thing that may be contributing to this is cultural- Maybe we western animators are afraid to let things breathe? Miyasaki (who's film "Howl's Moving Castle" is out and I plan on seeing it) has been quoted as saying a defining aspect of his movies is that he takes care to let the characters breathe. He described it as the enjoying the empty space between the clapping of the hands. We western animators tend to like to make the noise in the clapping. More noise and faster. I think maybe we need to allow the quietness between the claps to breathe a bit. It's that contrast between action and stillness that we need. We're pretty solid on the action, but could use some more stillness. Heck, sounds like our American society as a whole, don't it? I think the stillness is key to how we dial into the mind and soul of the character. Maybe we can't plug into a soul that's always hopping around like a maniac all the time. David Sloss, Animation Mentor student (and no doubt fine upstanding citizen :o) has posted on his blog a very nice review of his impressions on my monthly subscription based Video Tutorial Service. Oh, and while you're there check out the videos of his AM student assignments as well. Nice work, not shabby at all. I'm having a ton of fun on the VTS and the videos keep getting better and better due to subscriber feedback. The instruction has been evolving rather well and this month's video was almost 25 minutes long. Certainly longer than I had originaly intended when I started this thing, but I think it's good that way. Makes sure everybody's getting their money's worth and that we're covering the topics with enough thoroughness. And for those hearty and brave souls who have subscribed so far and endured my ramblings, my many humble thanks for your participation. This stuff is fun! In the end, it's all about the entertainment of the story and the emotion of given moment for the character. Everything serves those ends. Anything else added for the sake of "Just Because" is of no merit. Some of the best stuff out there can be said to violate one principle or another. So what? If it works, then it works. No more need be said or done. I like to think of the principles (not only in animation, but also in story development) as diagnostic tools. They are most helpful when something isn't working. Then you can hold up your work against the principles and see what might need some improvement. But if you go into the scene (or a story) trying to match the principles, like some laundry list of things 'To-Do', then you're failing before you start. They don't give awards for scenes that best fulfill the checklist of 12. They give awards for scenes that entertain, that capture the moment in a real, live, thinking, breathing, feeling character's life on screen. If the goal is wrong, the emphasis will be wrong and the effort will not succeed. The goal is to express the character sincerely, not exercise some kind of animated liturgy. I don't like principles being forced just because. Bleh. OK, I'm well into week 2 of my DNA animation experience. All I can do is smile and sigh the satisfied sighings of a man who has finally found the space to breathe after years of juggling flaming monkeys (my term for the daily life of being in management). I'm really enjoying the crew (talented, fun, good solid folks), the project (pretty solid stuff. Folks are gonna like it.) and most of all... the simplicity of being able to focus on animating. Nothing else, just animating. No rigging. No budgets. No schedules. No client meetings. No spreadsheets. No Word documents. No flowcharts. No resource management. No pipeline development. No layout. No data wrangling. No asset or inventory issues. No shot fixing. No production management. No hirings or firings. No endless meetings upon meetings. Acting, performance, entertainment, learning, pushing. All that stuff that got me thrilled to be involved in this business in the first place. I'm smiling right now. Thank you , Lord. Thank you SOOO much! Sorry for the mix up and inconvenience.